MHS junior Alyssa Smith (20) drives past Athens’ Mindi Gregory, during the second half of the Lady Marauders’ 61-40 victory on Monday in Rocksprings, Ohio. Meigs junior Jacynda Glover (14) hits a layup in the fourth quarter of the Lady Marauders’ 21-point win over Athens on Monday in Rocksprings, Ohio. ROCKSPRINGS, Ohio — Now that’s a winning combination. 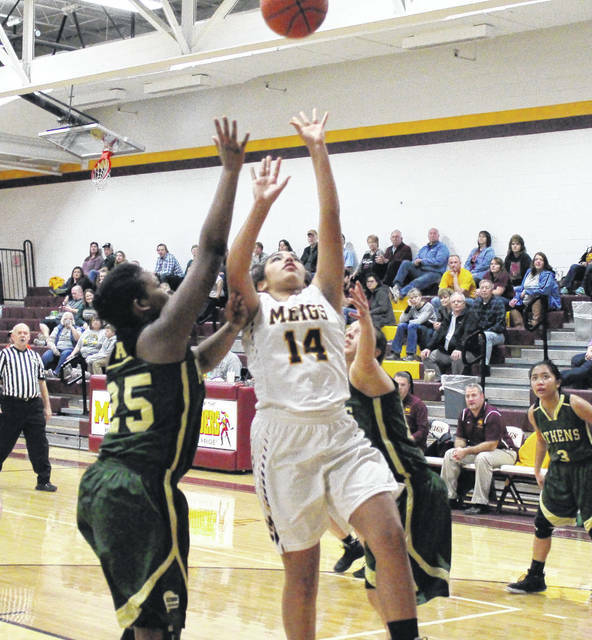 The Meigs girls basketball team turned the ball over just three times, while pulling in 20 offensive rebounds on Monday night at Larry R. Morrison, leading the Lady Marauders to a 61-40 victory over Tri-Valley Conference Ohio Division guest Athens. Meigs (8-7, 4-3 TVC Ohio) never trailed in the contest, scoring the first eight points and leading by as many as 10 in the opening quarter. Athens (2-14, 1-7) cut its deficit down to five points, at 14-9, by the end of the period and made it a one-possession game, at 14-11, within the opening 30 seconds of the second. The Lady Marauders increased their advantage to as many as 11 points in the second period, but settled for a 29-20 halftime lead. The Maroon and Gold doubled their guest in the third quarter, outscoring AHS by a 20-to-10 count to make the margin 49-30 with eight minutes to play. 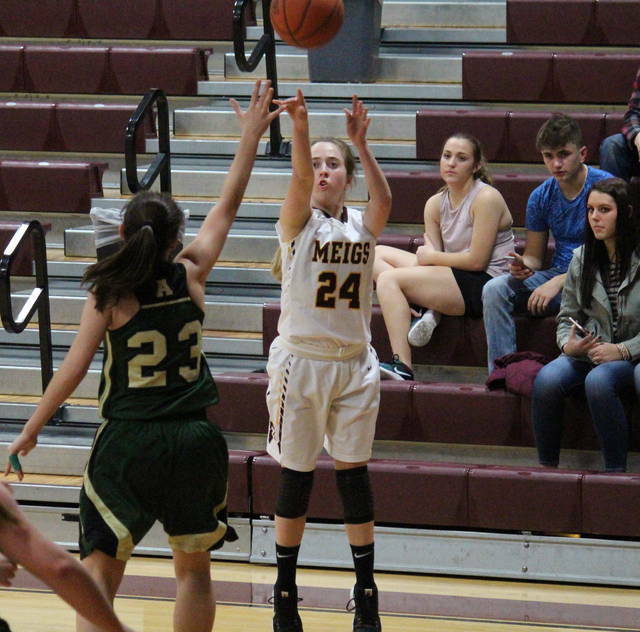 The Lady Bulldogs were held without a field goal for the first six minutes of the fourth quarter, as Meigs stretched its lead to a game-high 25 points, at 57-32. Athens closed the Lady Marauders’ 61-40 victory with an 8-to-4 run. In total, the Lady Marauders shot 22-of-65 (33.8 percent) from the field, including 10-of-27 (37 percent) from three-point range. Athens shot 14-of-42 (33.3 percent) from the field, including 5-of-19 (26.3 percent) from beyond the arc. Both teams made seven free throws, Meigs in 11 attempts for 63.6 percent and Athens in 13 tries for 53.8 percent. 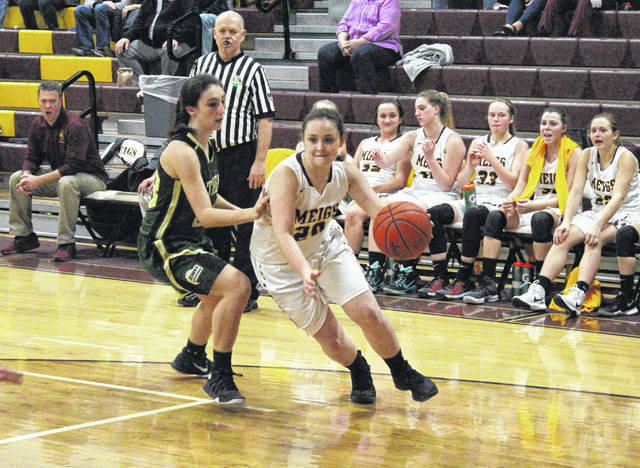 Meigs won the rebounding battle by a decisive 36-t0-21 tally, including 20-to-7 on the offensive end. The Lady Marauders’ three turnovers were 11 fewer than Athens’ total. MHS picked up a 14-to-7 assists advantage, while taking a 9-to-1 edge in steals and a 3-to-1 edge in blocked shot. Betzing led the Lady Marauders with 16 points, nine rebounds and eight assists. Becca Pullins drained a game-best four three-pointers and finished with 14 points for the Maroon and Gold. Fields and Devin Humphreys both had eight points for the victors, with Humphreys also grabbing in nine boards. Marissa Noble contributed seven points to the winning cause, Madison Hendricks chipped in with three, while Jacynda Glover and Alyssa Smith both added two. Jerrica Smith rounded out the scoring column for Meigs with one marker. Pullins and Taylor Swartz led the MHS defense with two steals and one block apiece, while Betzing came up with one steal and one rejection. Kaylee Stewart led Athens with 11 points, followed by Manderick and Lily Mills with eight each. Bella Tan had seven points for the guests, while Harter and Mindi Gregory scored three apiece. Mills led the Lady Bulldogs on the glass with eight boards, while Harter dished out a team-best three assists. The AHS defense was paced by Tan with a steal and Gregory with a rejection. The Lady Marauders have a makeup non-league game next, as they visit Eastern on Wednesday. 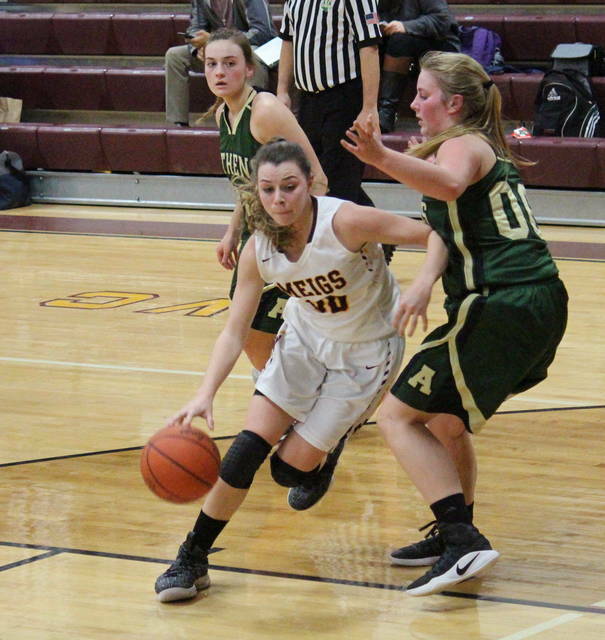 Meigs also defeated the Lady Bulldogs earlier this season, winning by a 55-26 final on Dec. 7 in The Plains.